Here is the Revell Pirate Ship painted with the main colors - black, red, gold and the natural wood decking. Still need to touch up here and there, but it is mostly done. Added a few spare GW parts to "bling" it out. What made me want to get this kit was the skulls already included - one on the rear (taffrail?) and one on the front (figure head?). I will be adding a few more GW spare parts like shields and a flag as well as more parts from the kit like the rigging that will go up to the hot air balloon. What will be used for the balloon itself is still up in the air. I'd like it to look something like an elongated football. Maybe with some da Vinci-like wings too. 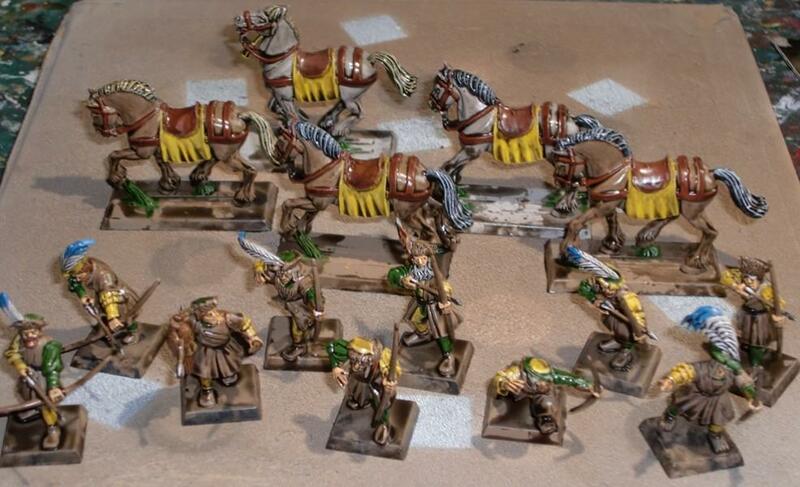 Got the standard bit parts in the mail today - painted them up for the Hangunner units for Hochland and Talabecland. 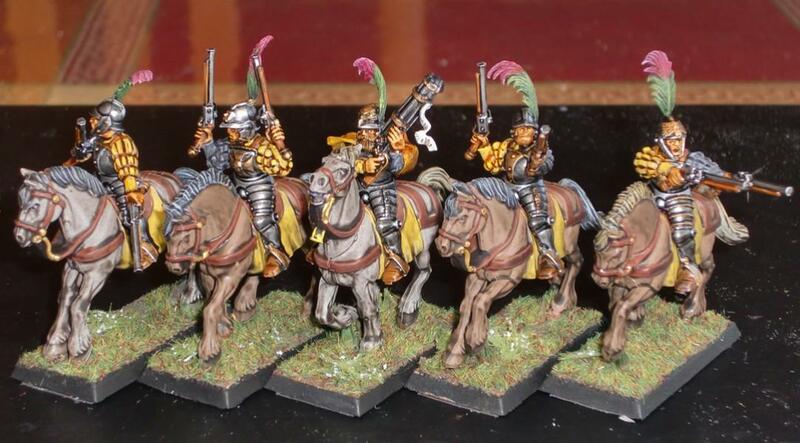 The Hochland unit is led by Hildegard von Konigsberg - a Raging Heroes figure. 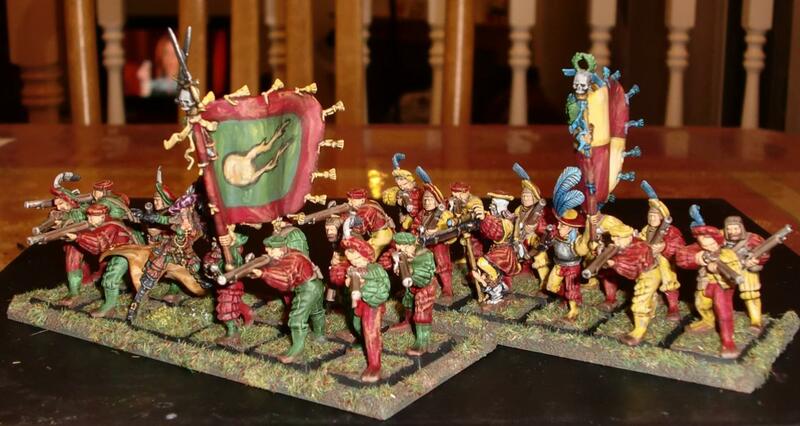 I plan to swap the Halberdier and Crossbow Detachments out for these two Handgunner units to see how they perform as individual Regiments. 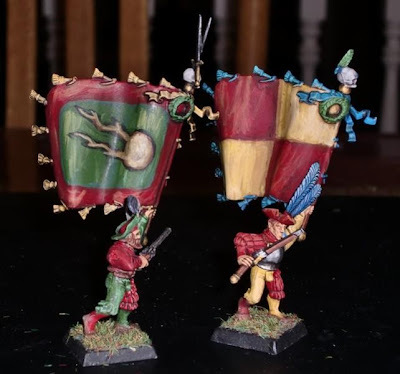 The Hochland's standard bears the Comet of Sigmar, and Talabecland's simply quartered.The standard bearers' right arms and handguns come from the Pistolier set; their heads from the Archer set. Now I plan to fiddle around with the Airship. 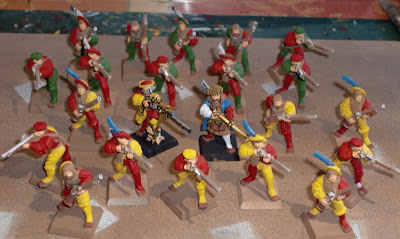 Since my gaming buddy, Pat L. (Socal Warhammer) had to cancel out of our planned practice game today - I ended up working on two units of Handgunners as well as two metal Master Engineers. I picked all of them up off of ebay - the two Engineers were the price of one of the current new resin/plastic models. The Handgunners were two separate buys, both for about a $1.00 per figure. 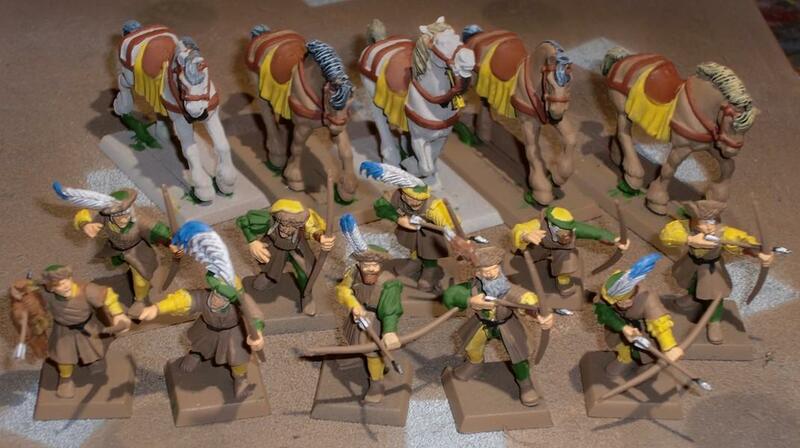 They are the older models, which match the other infantry types already in the army. Anyway, here they are freshly coated with Minwax Tudor Satin stain. 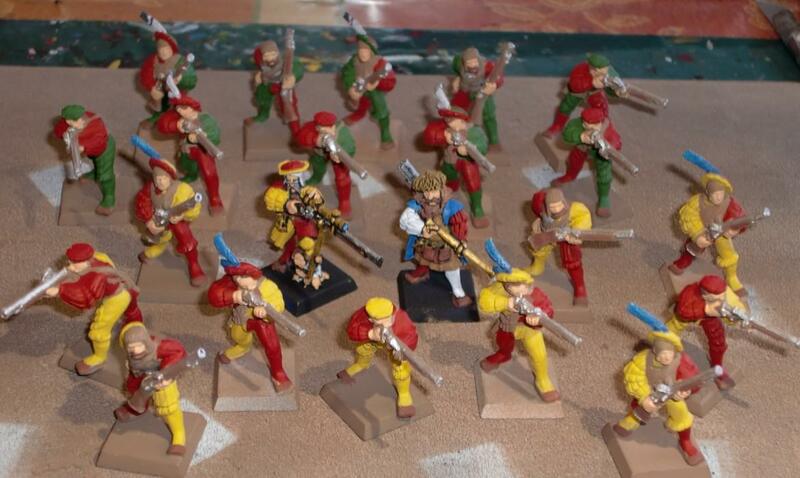 The Master Engineer with the Hochland Long Rifle will be the Marksman for a unit of Talabecland Handgunners. The other Master Engineer with Repeater Handgun will be used to assist a Great Cannon crew. 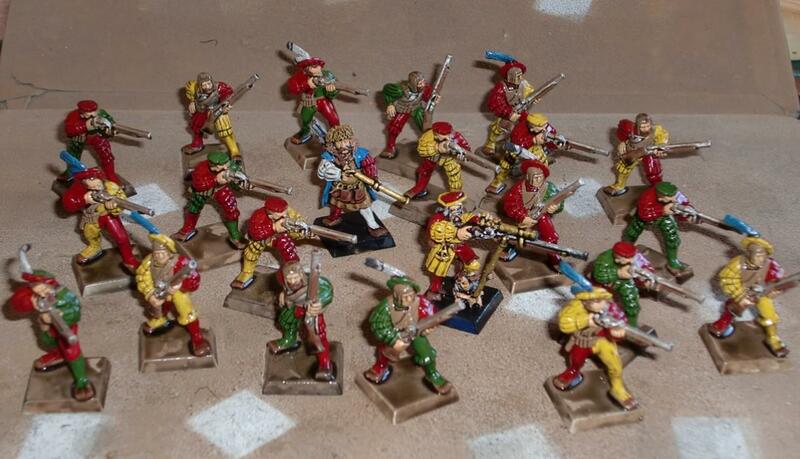 The Handgunners are painted up representing a unit each from Hochland and Talabecland. I'm still waiting on another ebay purchase - a bits lot with standards and musician parts. The photo below shows them with a basic block paint job. 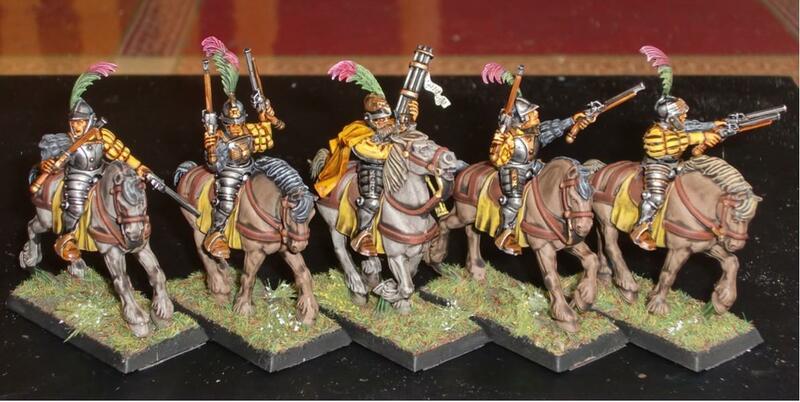 The Handgunners were base coated with a light brown to take care of much of their equipment. 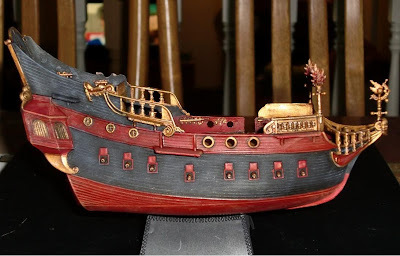 Finally, here is a shot of a 1/72nd scale Revell Pirate Ship model that was on clearance for $4.99 at the local Michael's. I hope to use it as an Airship. 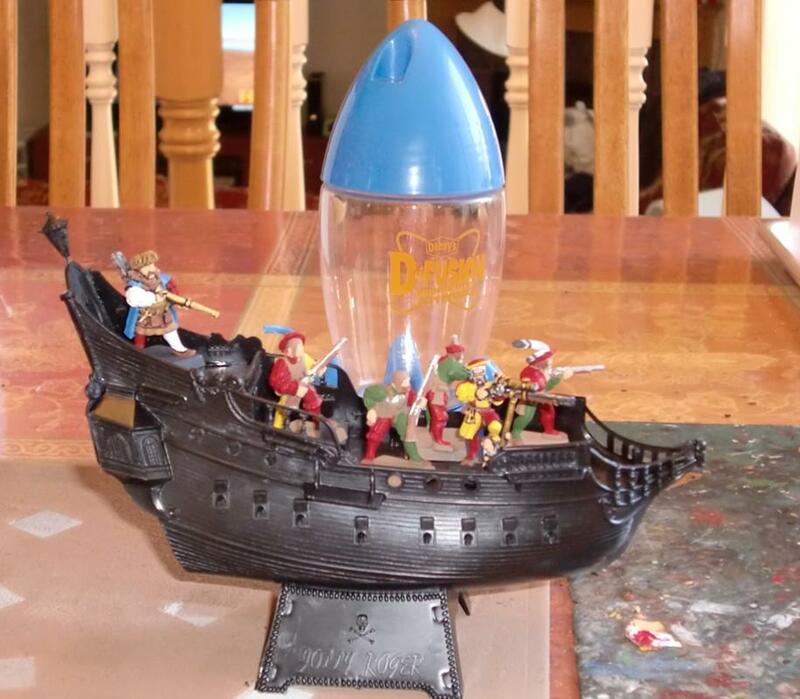 Behind it is a Denny's kid's drink cup in the shape of a rocket. I hope to convert this into a zeppelin to carry the Airship. Although 1/72nd scale, the deck is large enough to fit several figures. I managed to pick up a brush this weekend - a rather large brush at that. 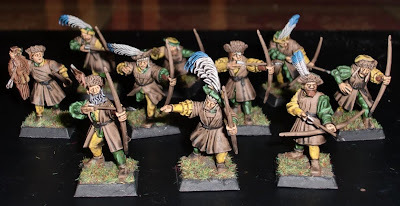 I didn't feel up to doing anything too detailed so painted up a unit each of WHFB Empire Pistoliers and Archers using the Minwax stain process. Here is a unit of Pistoliers hailing from Averland - a land famous for fine horses. 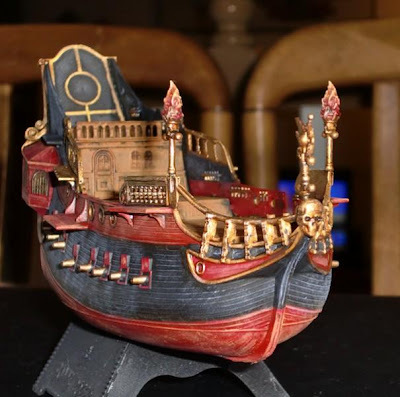 The Pistoliers were painted using a basecoat of Krylon Brilliant Silver which was then given a wash of Vallejo Black Ink/Stain. The Averland colors of yellow and black were only needed on the sleeves and pants - both very small areas. The Outrider champion wields a Repeater Handgun. Next is a unit of Archers from Stirland - renown for their hunting and woodland skills. The green was highlighted after the stain - to make it pop a bit. 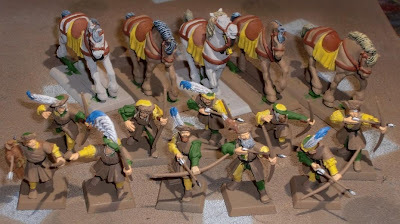 Here are some photos of the fairly simple and quick process used - a basic block paint job for the Archers and horses for the Pistoliers. The Archers and three of the horses were sprayed with a dark tan for an undercoat - which became the base colors for the Archers' coats and bows - as well as the horse flesh. The two other horses were given a coat of white. Followed by a stain of Minwax Tudor Satin. 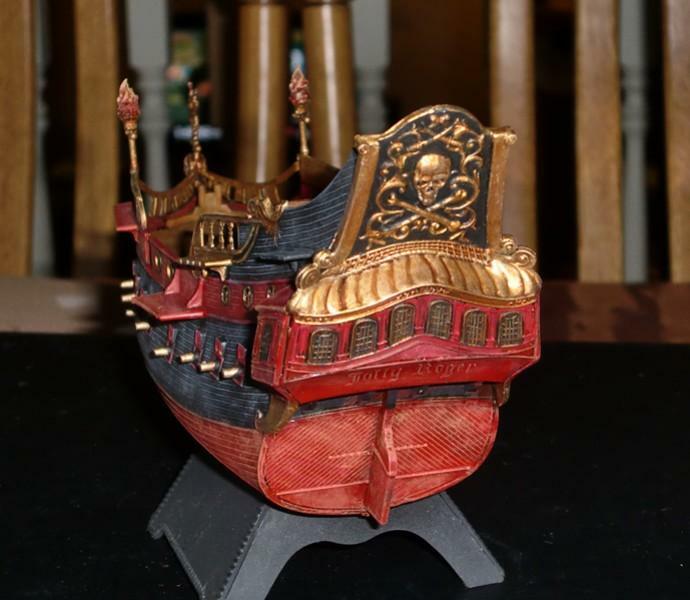 My buddy Pat L. (Socal Warhammer) and I plan to play a WHFB game next Friday. He is hosting a WHFB tournament next month at The Game Matrix - which I plan to attend. I had to cancel going to the Wet Coast GT up in Vancouver, B.C. this weekend due to my recent family business in Hawaii. 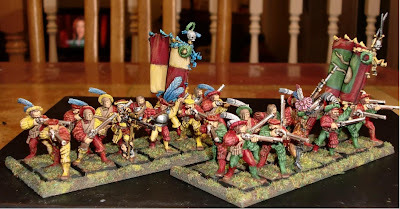 Anyway, I hope you like these new troops for the Empire army and thanks for following the blog. Been out of touch for a while - just returned from visiting my family in Hawaii. A couple of weeks ago my brother succumbed to liver cancer - he was only 57. Well, the nice thing was he was visited by a nonstop flow of his friends and family while in the hospital. His funeral was attended by close to five hundred people. At the time of his illness and passing he was the Chief Boatswain for the NOAA ship Oscar Elton Sette. The representative from NOAA, a Commander, read a letter from a Rear Admiral which among other things called my brother a legend in the Pacific for NOAA. He will be sorely missed by many, but everyone has fond memories of him to cherish. Anyway, I'm back in WA State and have a few small projects I hope to start on once I get back in the mood - whenever that may be. 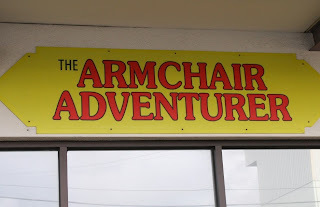 One thing I did while in Hawaii that was hobby related was stopping in a fantastic store called The Armchair Adventurer. It is run by a gentleman by the name of Glen Fong. 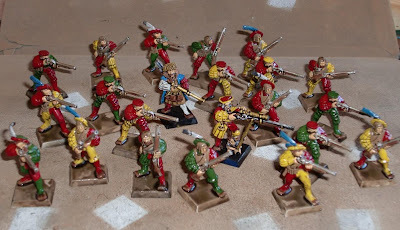 He had a store at another location many years ago where he steered me into my first 28mm figures - Redoubt Trojan War figures. His store consists of several rooms with models, books, kits and board games stacked to the ceiling. He has untold boxes of old lead like 25mm Essex Napoleonics to newer plastics like Warlord Games and Perry. As for model kits he has one of a kind stuff like the submarine from Voyage to the Bottom of the Sea. I picked up a long OOP Warmaster Empire Hero on Griffon. It was just too cool not to get. Incidentally, Glen and I have little bit in common, we're both '79 high school grads from Hawaii and served in the US Army.